The present study aimed to investigate the potential impacts of Atlantic Bluefin Tuna (Thunnus thynnus) farming in offshore cage systems in the Aegean Sea (Sığacık Bay-Izmir, Turkey), in respect to physico-chemical water quality parameters, nutrient loads, chlorophyll-a, total suspended solids, zooplankton groups, and TRIX index calculations for the potentially affected cage farm area and an unaffected reference site. Concentrations of physico-chemical variables (temperature, salinity, dissolved oxygen, pH) in the study carried out in May and August 2018, were within the acceptable limits for marine aquaculture in terms of water quality characteristics. The concentrations of PO4-P, NH4-N, and NO2-N showed no temporal or spatial changes, and were recorded below 0.01 mg/L (<0.01) for PO4-P and NH4-N, whereas lower than 0.005 mg/L (<0.005) for NO2-N values in both cage and reference stations in May and August 2018 periods. Results showed low levels of TSS (0.33-11.87 mg/L), both in the cage farm area and the reference site, remaining below the general quality criteria of 30 mg/L for marine environment. No eutrophication risk (TRIX index, T<4) was observed around the Tuna Cage Farm Site in Sığacık Bay, according to the legislations enacted for “Sensitive Areas of Enclosed Bays where fish farms are not allowed”. Based on these findings, demonstrating highly interactive trophic level variability, it can be concluded that the impacts of the Tuna Cage Farm were not significant, possibly due to the consistent movement of the water in currents in the study area. Atienza, D., Calbet, A., Saiz, E., Alcaraz, M., Trepat, I. (2006). Trophic impact, metabolism and biogeochemical role of the marine cladoceran Penilia avirostris and the co-dominant copepod Oithona nana in NW Mediterranean coastal waters. Marine Biology International Journal on Life in Oceans and Coastal Waters, 15(2), 221-235. Besiktepe, S., Sur, H.I., Ozsoy, E., Latif, M.A., Oguz, T., Unluata, U. (1994). The circulation and hydrography of the Marmara Sea. Progress in Oceanography, 34, 285-334. Carlotti, F., Harris, R. (2007). The biology and ecology of Centropages typicus an introduction. Progress in Oceanography, 72, 117-120. Castellani, C., Licandro, P., Fileman, E., DiCapua, I., Mazzocchi, M.G. (2015). Oithona similis likes it cool: evidence from two long-term time series. Journal of Plankton Research, 38, 703-717. Clesceri, L.S., Greenberg, A.E., Eaton, A.E. (1998). Standard Methods for the Examination of Water and Wastewater 20th Edition [Method 2540 B. (Total Solids), Method 2540 C. (Total Dissolved Solids) and Method 2540 D. (Total Suspended Solids)]. American Public Health Association, Washington, p. 1325. CSB (2018). Deniz kalitesi bülteni, Ege Denizi. T.C. Çevre ve Şehircilik Bakanlığı, Çevresel Etki Değerlendirmesi İzin ve Denetim Genel Müdürlüğü Yayınları, p. 21. Della, Croce, N., Venugopal, P. (1972). Distribution of marine cladocerans in the Indian Ocean. Marine Biology, 15, 132-138. Fessenden, L., Cowles, T.J. (1994). Copepod predation on phagotrophic ciliates in Oregon coastal waters. Marine Ecology Progress Series, 107, 103-111. Ganguly, D., Patra, S., Muduli, P.R., Vardhan, K.V., Abhilash, R.K., Robin, R.S., Subramanian, B.R. (2015). Influence of nutrient input on the trophic state of a tropical brackish water lagoon. Journal of Earth System Science, 124, 1005-1017. Giesecke, R., Gonzalez, H.E. (2008). Reproduction and feeding of Sagitta enflata in the Humboldt Current system off Chile. ICES- Journal of Marine Science, 65, 361-370. Granada, L., Sousa, N., Lopes, S., Lemos, M.F.L. (2015). Is integrated multitrophic aquaculture the solution to the sectors’ major challenges? – a review. 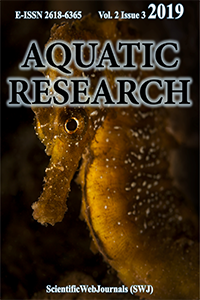 Reviews in Aquaculture, 8(3), 283-300. Katechakis, A., Stibor, H., Sommer, U., Hansen, T. (2004). Feeding selectivities and food niche separation of Acartia clausi, Penilia avirostris (Crustacea) and Doliolum denticulatum (Thaliacea) in Blanes Bay (Catalan Sea, NW Mediterranean). Journal of Plankton Research, 26, 589-603. Kautsky, N., Berg, H., Folke, C., Larsson, J., Troell, M. (1997). Ecological footprint for assessment of resource use and development limitations in shrimp and tilapia aquaculture. Aquaculture Research, 28, 753–766. Kleppel, G.S. (1993). On the diets of calanoid copepods. Marine Ecology Progress Series, 99, 183–195. Kocak E., 2018. Açık-Deniz Orkinos Balık Yetiştiriciliği ve Yasal Sınırlamaların Büyük Ölçekli Bir Tesis Örneği Üzerinden İncelenmesi. Niğde Ömer Halisdemir Üniversitesi Mühendislik Bilimleri Dergisi / OHU Journal of Engineering Science, 7, 558-565. Kocatas, A. (1993). Oseanoloji. Ege Üniversitesi Kitaplar Serisi, Bornova, İzmir. p. 358. Kocum, E. (2005). Çanakkale Boğazında Klorofil-a ve Çözünmüş Mineral Besin Elementi Miktarlarının Analizi. Ekoloji 15, 1-6. Nakamura, Y., Turner, J.T. (1997). Predation and repiration by the small cyclopoid copepod Oithona similis: how important is feeding on cliates and heterotrophic flagellates? Journal of Plankton Research, 19, 1275-1288. Ozel, İ. (1998). Planktonoloji 1. Ege Üniversitesi Su Ürünleri Fakültesi Yayınları, p. 2-88. Paffenhöfer, G.A., Knowles, S.C. (1980). Omnivorousness in marine planktonic copepods. Journal of Plankton Research, 2, 355–365. Palta, Z.H. (2010). Gerence ve Sığacık Körfez’inde (Ege Denizi), iki ağ kafes işletmesinde çevresel parametrelerin zooplankton dinamiğine etkisi. Yüksek Lisans Tezi, Çanakkale Onsekiz Mart Üniversitesi Fen Bilimleri Enstitüsü. p. 91. Siokou-frangou, I., Papathanassiou, A.E., Lepretre Frontier S. (1998). Zooplankton assemblages and influence of environmental parameters on them in a Mediterranean coastal area. Journal of Plankton Research, 20, 847-870. Sommer, F., Stibor, H., Sommer, U., Velimirov, B. (2000). Grazing by mesozooplankton from Kiel Bight, Baltic Sea, on different sized algae and natural seston size fractions. Marine Ecology Progress Series, 199, 43–53. Spinelli, M., Guerrero, R., Pajaro, M., Capitanio, F. (2013). Distribution Of Oikopleura dioica (Tunicata, Appendicularia) Associated With A Coastal Frontal System (39°- 41°S) of the SW Atlantic Ocean in the Spawning Area of Engraulis anchoita Anchovy. Brazilian Journal of Oceanography, 61, 141-148. Steele, J.H. (1970). Marine Food Chains. University of California Press (Berkeley and Los Angeles). 1st ed. Stibor, H., Vadstein, O., Lippert, B., Roederer, W., Olsen, Y. (2004). Calanoid copepods and nutrient enrichment determine population dynamics of the appendicularian Oikopleura dioica: a mesocosm experiment. Marine Ecology Progress Series, 270, 209–215. Strickland, J.D.H., Parsons, T.R. (1972). A practical handbook of seawater analysis. 2nd ed. Bulletin, Ottowa: Fisheries Research Board of Canada, 167, 310. WPCL (2004). Water Pollution Control Legislation, Su Kirliliği Kontrolü Yönetmeliği, Resmi Gazete: Tarih 31 Aralık Cuma Sayı: 25687. Todd, C.D., Laverack, M.S., Boxshall, G.A. (2006). Coastal Marine Zooplankton: A Practical Manual for Students. 2nd ed. University Press, Cambridge. Tregouboff, G., Rose, M. (1957). Manuel De Planctonologie Mediterranéenne. Tome I: Texte. Tome II: Planches. Centre National De La Recherce Scientifique. Paris. Turner, J.T., Tester, P.A., Ferguson, R.L. (1988). The marine cladocerans Penilia avirostris and the “microbial loop” of pelagic food webs. Limnology and Oceanography, 33, 245-255. Uye, S., Ichino, S. (1995). Seasonal variations in abundance, size composition, biomass and production rate of Uikopleura dioica (Fol) (Tunicata: Appendicularia) in a temperate eutrophic inlet. Journal of Experimental Marine Biology and Ecology, 189, 1-11. Yildirim, Ö., Korkut A.Y. (2004). Su Ürünleri Yemlerinin Çevreye Etkisi. E.Ü. Su Ürünleri dergisi, E.Ü. Journal of Fisheries and Aquatic Sciences, 21, 167-172.